It's hard to keep up with these guys. I've been to Stone Brewing HQ in Escondido. Working on getting to Berlin. Napa? I should be able to in a few weeks. But, Shanghai's gonna take another level of effort. Fun to watch these guys grow and introduce their beer to the world. Here's the latest press release. ESCONDIDO, CA (July 26, 2018) – With winds in its sails, a whole lot of grit and z-e-r-o Big Beer investment, Stone Brewing marks an expansion milestone for U.S. craft beer this week. America’s 8th largest craft brewery opened three first-class craft beer destinations on three continents over three consecutive months. This trifecta of expansion around the globe celebrates the continued rise and appreciation for craft beer in far-flung markets. 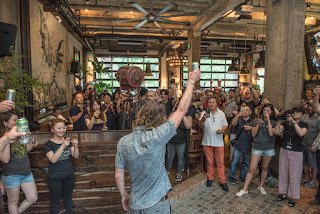 With pints held high, Stone Brewing proudly announces the opening of Stone Brewing Tap Room – Shanghai, preceded by Stone Brewing – Napa and the Berlin city center Stone Brewing Tap Room – Prenzlauer Berg. 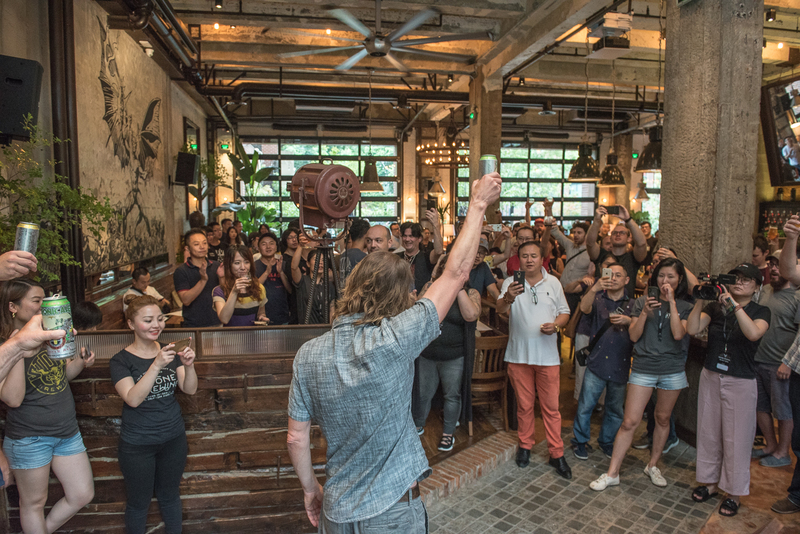 The auspicious opening of Stone Brewing Tap Room - Shanghai this week marks the first tap room by an independent American craft brewery in China, and unabashedly raises the bar for craft beer in Asia. To deliver a world-class beer experience Stone Brewing painstakingly designed the first uninterrupted cold chain delivery of US craft beer to China last year, and continues its tally of ‘firsts’ with the installation of a ‘flux capacitor tap system’ at the newly opened tap room. A first in Asia, this special manifold system is a principal example of elevating the craft beer experience, and allows for custom calibration of carbon dioxide and nitrogen mixes for each and every of the restaurant’s 30 beers on tap. Stone’s meticulous approach to each beer’s delivery is indisputably matched by the environment surrounding it. Stone’s 3,200 square-foot bar and restaurant offers seating for 90 indoors and 28 in the additional 1,000 square-foot gardens. Floor to ceiling custom roll-up doors open the tap room to the outdoors on two sides. The interior incorporates reclaimed wood, concrete, steel and vintage furnishing, a main bar and an oversized fireplace lounge. The Stone Brewing World Bistro & Gardens food philosophy translates to Stone’s first Asia project, incorporating artisanal products with a focus on environmental responsibility and high-quality ingredients. Last month Stone Brewing – Napa brought its renovated 1877 downtown Napa building to life in the heart of California’s wine country. The 9,500 square-foot restaurant and 10-barrel brewery offers locally-brewed beers, a dining experience, growler fills and merchandise. The Napa brewing program is led by Steve Gonzalez, Stone’s six-year veteran Small Batch Senior Manager of Brewing & Innovation. Fortuitously, Steve also had a former career as a winemaker, making him uniquely qualified to bring together the two industries in distinct and special ways. This will manifest itself in brewing techniques that include wine-barrel aging, beer recipes that include wine grapes, as well as interesting botanicals from the region’s diverse ecology. In mid-May, Stone Brewing Tap Room – Prenzlauer Berg opened in the Berlin city center, 53 minutes by bike from the brewery and Stone Brewing World Bistro & Gardens – Berlin. The 1,000 square-foot outpost offers popular bistro menu items alongside international street foods. The destination takes inspiration from the expansive Stone Brewing World Bistro & Gardens – Berlin, with a more intimate approach in a bustling and vibrant neighborhood known for its outdoor Mauerpark Market. In usual Stone fashion, multiple taps are dedicated to international guest beers, making it another authentic destination for the craft beer adventurer. With the addition of these three new locations, Stone’s unique venues now total 11 in number. Like-minded in approach, each exists to elevate the craft beer experience while creating an environment that fosters togetherness and affinity for the art of craft. The spirit and philosophy of Stone guides every project, but each is exclusive to its own surroundings, building’s character and local community. And speaking of that spirit and philosophy of Stone, did we mention we did it all without the help of Big Beer? Founders Steve Wagner and Greg Koch retain full Board control of the company to this day, ensuring that the company stays true to its ethos and ideals of the past 22 years!